New Holland is collaborating with Rockford Construction on the build-out, and they see the New Holland project as a key partnership in revitalizing the Westside neighborhood of Grand Rapids. 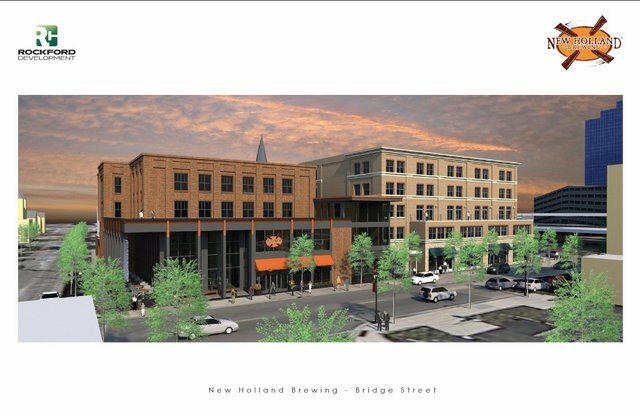 New Holland Brewing Co., Michigan’s third largest brewery and first craft whiskey distiller, has just signed a lease with Rockford Construction and plans to launch a new brewpub, micro-distillery and restaurant in early 2016 in Grand Rapids, Mich.’s Westside neighborhood. The new endeavor supports the company’s goals to reach the growing craft consumer in New Holland’s home market of West Michigan and beyond. New Holland plans to house its growing sour beer program (internally known as The House of Funk) at the Bridge St. location, as well as produce small batch whiskey onsite. The bar will feature existing New Holland beer and spirit brands, as well as many pub-only offerings brewed and distilled onsite. Plans include brewing a monthly specialty beer in which a portion of the proceeds will benefit the Westside Neighborhood Association. A focus on a mindfully sourced food menu will also be a top priority for the new location. Final plans are still in process, but the New Holland management team looks for the new venture to open in early 2016 and anticipates on hiring approximately 150 new employees prior to the launch. Kevin Watkins liked this on Facebook.